To describe the climate between Karwendel and the Dolomites, as much high-quality data as available are needed. Hence, in a first step meteorological measurements in the area and the surroundings were collected. Table 1 gives an overview of network operators, which have thankfully provided data, the number of stations included in the analysis and for how many of them at least one complete series for the climate period 1981 – 2010 could be constructed. The following parameter-dependent information shows the number of gapless series in the considered area. It is evident that the station density concerning temperature and precipitation is high, for snow with some concessions as well, while the density for the other parameters is sparse. Model data solely available for Austria were therefore used as a basis for the radiation maps (Olefs and Schöner 2012; Olefs 2013). 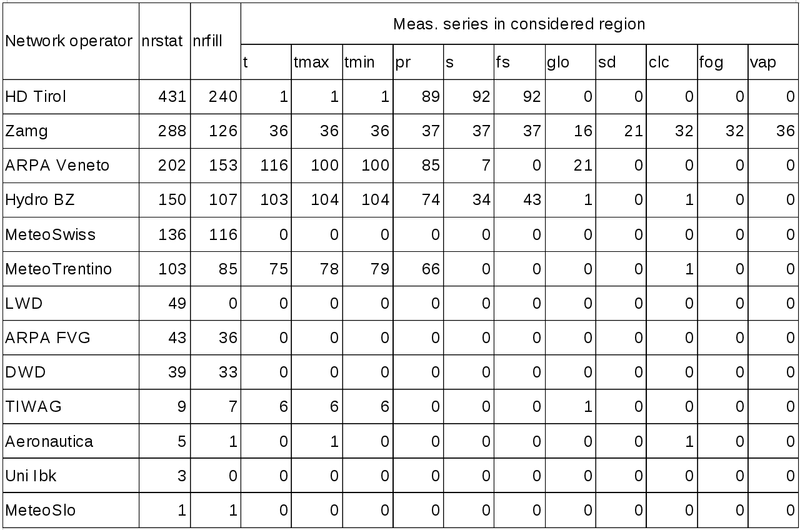 Table 1: Network operator, number of stations, stations with gapless series in the climate period 1981 – 2010 and available series within the considered region for individual parameters. t, tmax, tmin denote daily mean, maximum and minimum temperature, pr stands for precipitation, s for snow, fs for freshfallen snow, glo for global radiation, sd for sunshine duration, clc for cloud cover, fog for occurrence of fog and vap for water vapour pressure. At selected key stations not only was the climate period examined, but also the whole measurement period, in order to enable statements on observed climate changes. Therefore changes in the location and the measurement setup had to be explored to enable a homogeneous data set. This is, among other techniques, established by comparison to stations in the vicinity. For this purpose measurements before 1981 were also integrated. Partly these had to first be digitised from climate sheets. All in all data from 42 stations were added in this way. Details concerning the homogenisation of the key stations are found here. As mentioned gapless series of daily data build the basis for the maps and the analysis of the stations, i.e. complete series are required to compute all needed climate indices. For example the number of frost days in the climate period 1981 – 2010 can only be calculated if daily information for this period is available. The possibility to link series of measurements after repositioning was thoroughly investigated in each case, e.g. the horizontal distance must not exceed 5 km and the difference in station height is limited to 200 m. Filling of gaps in the quality controlled data was established by comparison with the highest correlated neighbouring stations. The required minimum availability of the original data was selected sensibly for each parameter and is at least 50 %. The filling algorithm relies on the values at the neighbouring stations and a seasonal correction factor or additive value. The method for obtaining daily means based on observations or higher resolution measurements is inconsistent between the considered regions. Hence daily mean temperature was determined in a coherent way as the mean of maximum and minimum temperature. Country-specific corrections were adapted to derived monthly temperature data by making monthly adjustments based on height steps in inner alpine regions and distinguishing between urban and rural station locations elsewhere (Hiebl et al. 2009).